And hey, once you've seen it you can skip every other movie in the same vein, because they're all sad imitations. The Black Dahlia and Hollywoodland -- kill me. 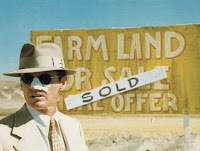 Chinatown is probably one of my favorite five movies of all time, maybe even my very favorite. What you say is true -- it's incredibly well done. The cast is stellar, and the film looks gorgeous.